Knowing the cause of your dog’s mouth burns can make the difference between guessing about a remedy and diagnosing the ailment for faster treatment. Dogs are wonderful companions, but when out of their owner’s sight they can wreak havoc by chewing electrical cords, tipping over chemical bottles and ingesting hot liquids. Such behaviors can result in mild to serious mouth burns and a number of serious conditions. Providing the correct aid to a dog's mouth burns through veterinarian consultations and at-home methods will assist in its recovery and enhance its comfort. 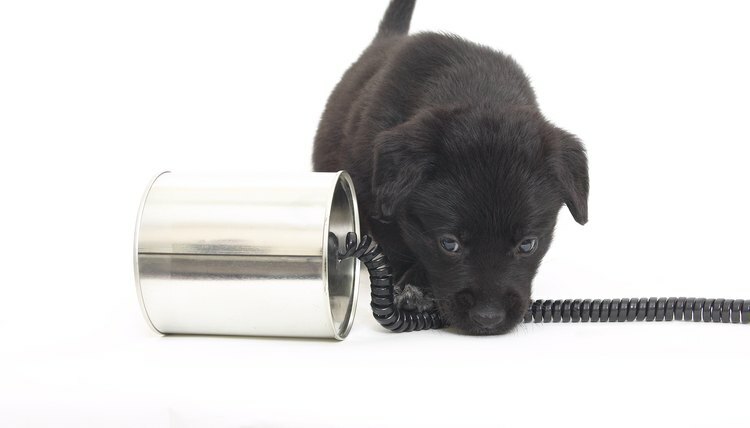 Figure out the source of the burn by watching your dog’s behavior and looking around your house for chewed electrical cords, spilled household cleaners or hot liquids your dog could have encountered. Report this to the veterinarian. Monitor your dog’s symptoms. Blisters and redness represent a superficial, first-degree burn. A swollen tongue, decreased appetite, drooling, pawing the mouth and increased swallowing typically indicates a heat or chemical burn. Difficulty breathing, rapid heartbeat, seizures, shock and burns around the outside of the mouth indicate electrical burns. Electric shock can cause cardiac arrest and death. Chemical burns can lead to burning in the esophagus and stomach. Call your veterinarian to explain the symptoms and ask for advice on how to aid the dog. Bring your dog into the veterinarian immediately if symptoms worsen or if your dog has second- or third-degree burns indicated by swelling, loss of fur, burn sores or charred or whitened skin in or around the mouth. Lay the dog on his side. Flush the dog’s mouth out with cupfuls of cold water for 20 minutes to soothe the mouth and to decrease the amount of chemical or first-degree superficial heat-burn damage. Apply a cold compress to first-degree burns around the mouth. Cover the burns around the mouth with a non-stick bandage or dressing. Follow veterinarian instructions on applying topical ointments, changing dressings and giving prescription medications such as antibiotics. Feed soft dog food and cold water or a slurry of food through a feeding tube to dogs with superficial burns, based on veterinarian recommendations.